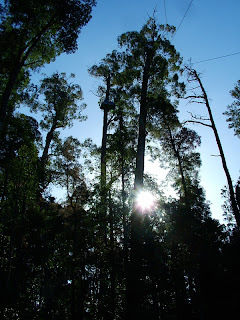 Old Growth Forest - Gone forever? 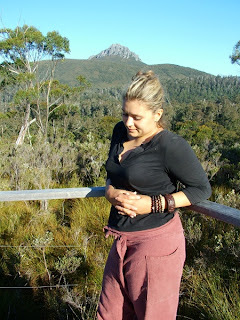 I travelled back to Tasmania 1 more time over Dec/Jan 08 for a friend's wedding. At the same time, i gave myself a week to travel around the south west of Tasmania to explore the old growth forests of Tasmania. This includes the Upper Florentine, and the Styx. I came across some protesters living in the trees. My heart goes out to these people as they perform an act of pure love for the forest. They understand, more than any government, the importance of them. As i entered the protest site, there was a huge banner. 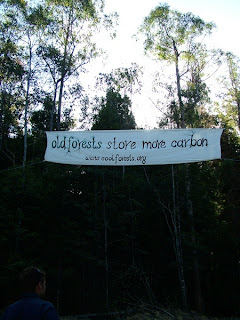 (picture attached) The bold words of 'Old Forests store more carbon' www.coolforests.org - stared at me and i had to take a photo to remind myself to look up the website at a later date. As i proceeded through the camp site I met a few friendly, welcoming and smoked dreadlocked protesters. They proceeded to tell me the bull dozers were to arrive on the 7th January 2008 to start logging the upper florentine. Not knowing what day it was as they had been living in the forest for some time, we realised it would be in less than 5 days. Now as that deadline has passed, i know not if the forest is gone or if they won the battle of their tree top protest. I do know that the walk i did to reach the Upper Florentine lookout was worth more than the woodchips that the forest would turn into - had Gunns and Forest Tasmania had their way. Like a giant safe-deposit box, old growth forests lock in vast amounts of carbon. As trees and undergrowth grow they draw in carbon dioxide. Over centuries, this carbon is slowly cycled into woody debris and forest soils. Ancient old growth trees, can store tonnes of carbon. After hundreds of years, old growth forests can contain over 1200 tonnes of carbon per hectare (Dean, C. et al 2003). Unfortunately much of Australia's remaining old growth forest is threatened by logging. Research shows that it is better, for climate change, to leave old growth forests in the ground rather than logging them and converting them to regrowth or plantations. As forests age, they build up a larger capacity to store carbon in wood, soil and woody debris. Logging undermines this capacity. American and European research indicates that, because old growth forests are able to store much larger amounts of carbon, conversion of old growth forests to younger forests will lead to massive carbon losses to the atmosphere (Harmon, M. et al 1990, Schulze E. et al 2000). Australian research also demonstrates that, when an old growth forest is logged and converted to regrowth forest managed on 80 year rotations, the carbon storage capacity is reduced by two thirds (Dean, C. et al 2003). Logging old growth forests results in a major climate change impact. Based on these studies, the carbon dioxide emissions from Victoria’s logging alone is estimated to be almost 10 million tonnes. This is the equivalent to the emissions generated by adding almost 2.4 million cars onto the roads each year.